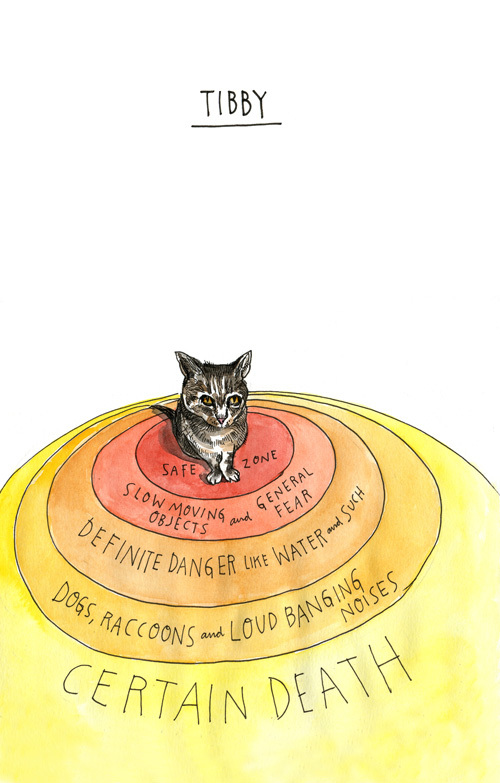 This is just a fantastic illustration from a book that I desperately want to read called "Lost Cat: A True Story of Love, Desperation and GPS Technology" by Caroline Paul with illustrations by Wendy MacNaughton. The description sounds awesome, the illustrations are a hoot and I think any cat lover would look at this picture and knowingly nod. The illustration strikes me where I live, in "change" work with associations. Obviously Tibby the cat is convinced (from his feline point of view) that these change scenarios and their locus to his fuzzy face are true. And we, as humans, nervously laugh. While we intellectually know the last circle of "certain death" is probably not true, if we put ourselves in that picture we can see that in our own lives we sometimes act just like Tibby. Our association and nonprofit boards of directors, volunteers and staff frequently get caught up in these scenarios. As if somehow the "safe" zone is exactly where we are....and not one foot over either to the left or to the right. But "safe" is not safe forever. Change will-come-is-coming-has-come. At some point, the lure of the dinner plate or the litter box will overcome our common sense and force us to bravely move from where we are. What I find so cool about this graphic and this idea is that the safe zone moves with us no matter where we are. As our boards and staff move together into the future, the scary territory of the "new" becomes safe again as the known territory of "old." Our center of safety is always with us if we stay true to our mission, our vision and ourselves. I hear a lot these days about the "certain death" of associations and I am relatively sure the rumors of our demise have been greatly exaggerated. More importantly, as the environment becomes more chaotic - we simply have more chances to "move the safe zone" with us. Tibby may feel like certain death is a mere two feet away, but at the end of the day certain death really isn't so certain after all. So go forward and make some good decisions this week. Feel confident that even if you feel anxious about moving in one direction or the other, your safe zone will move with you. Be smart. Use data. Have fun. And when you have those discussions with your volunteers about moving one direction or the other, make sure you go together and the odds are you will do just fine.